All Sundays of the year are festivals of our Lord Jesus Christ. The Church Year: St. Paul celebrates all Sundays and Principal Festivals based on commemorative events in Jesus' life. We also celebrate significant individuals in the history of the Church. Equal to the importance of Festivals are Days of Special Devotion; Ash Wednesday and all days in Holy Week (especially Good Friday). 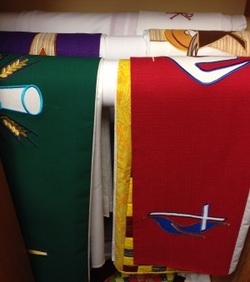 Liturgical colors include white, blue, green, purple, scarlet, gold, and red. The day's color will be worn on the vestments of all ministers and the parament (cloth) on the altar. The Propers are based on a three year rotation of A, B, and C. They include scripture readings and other texts that are chosen to support the church year. Each year has a Gospel focus. Year A is the Gospel of Matthew, Year B is the Gospel of Mark, Year C is the Gospel of Luke. This information is found in the Evangelical Lutheran Worship Pew Edition Hymnal in our church (2006 version). This book is an amazing resource! Usually we just flip to the back of the book for Service Music...but I invite you to take a few moments to get better acquainted with your hymnal. Daily Lectionary: Used in relation to years A, B, C, the daily readings prepare you for the Sunday reading.